On Saturday, January 29, 2011, members of the Wawel Folk Ensemble were invited to participate at the 32nd Annual Bal Radiowy by leading the guests in the Polonez. Dressed in city Zywiec and the Kontusz, members of Wawel first demonstrated the basic Polonez step, and then invited members of the audience to dance the Polonez with them. Members of the Ensemble remained following the performance as the enjoyed the musical stylings of Zespol Rytm. Wawel's next public performance is February 19, 2011 at St. Theresa of Avila's annual Polish Night in Warren, Michigan. On Wednesday, January 26, 2011, the Wawel Folk Ensemble performed at a Polish Night for residents of the Pine Ridge Villas of Shelby in Shelby Township, Michigan. The performance was Wawel's first of 2011. For not having a public performance in a little over a month, Wawel got 2011 off with a bang presenting an hour long program for the residents. The program featured Wawel's Sieradz, Lubelski, Cieszyn, Rzeszow and Lowicz suites as well as the Krakowiak and Kadzioleczka. At the conclusion of the performance, Wawel members grabbed some of the residents in attendance and led them in a polka along. A good time was had by all. Wawel's next public appearance will be at Bal Radiowy on January 29, 2011 at the American Polish Cultural Center in Troy, Michigan. Lots more to come in 2011. We hope you'll check back soon for all the latest happenings. Save the Date: February 11, 2011! Happy 2011! It's only 6 days into the new year, and the Wawel Folk Ensemble has already shaken off the post-holiday blahs. 2011 will be another big year for the Ensemble, with trips to Milwaukee's Polish Fest and the Rzeszow Folk Festival in Poland already on the books. 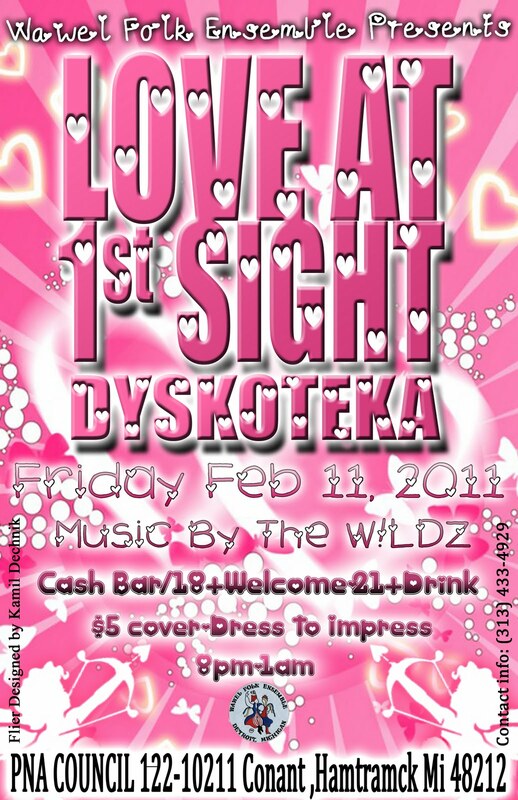 On Friday, February 11, 2011, the Wawel Folk Ensemble will host a Valentine's Dyskoteka at PNA Council 122 in Hamtramck, Michigan from 8 pm - 1 am. 18 and up are welcome. Cash Bar is available. The Dyskoteka will feature local DJs (and Wawel members) the W!LDZ, who recently opened sets for renowned Chicago DJ Markski. Proceeds from this event will go toward the Ensemble's trip to Poland to attend the Rzeszow Festival in July 2011. Additional information will follow. Please check back soon!